Watch out for "La Pantera" or "The Panther"! 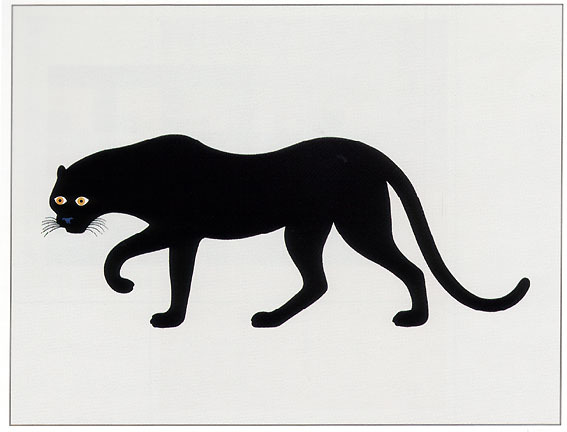 Super graphic styled mod Panther screenprint designed by Enzo Mari in 1963 for Danese Milano, Italy . A classic in the history of Modern Design! From Enzo Mari's nature series. A happy and stylish artwork that will brighten up any room and provide joy for both adults and children! A stylish alternative in your modern room and office! Check our other Danese items. Material: Screenprint hung by means of two horizontally placed strips of PVC (provided). Enzo Mari was born in Novara in 1932, and is one of the most authoritative exponents on the Italian design scenario. He studied at the Academy of Fine Arts in Milan. His work was exhibited in a number of editions of the Venice Biennial and the Triennial of Milan. His work involves design with focus on research, projects in graphic design, product design and exhibition layout. In 1971, he took part in the exhibition "Italy: The New Domestic Landscape" organized by MOMA of New York. He won three Compassi d'Oro (1967, 1979, 1987). His work is on display at the National Gallery of Modern Art in Rome, at the Modern Museet in Stockholm, at the Stedeljik Museum in Amsterdam, at the Musée du Louvre in Paris, at the Kunstmuseum in Dusseldorf. He teaches at Isia in Florence and at the European Design Institute in Milan.